Microbial analysis plays an important role in cleaning validation because the equipment must be leaned chemically as well as micro biologically before starting the manufacturing of new batch. Cleaning validation is the process in which documentation of how the cleaning process of manufacturing equipment is done. Most times during manufacturing and processing of pharmaceutical products, active residues are left on the equipment and it may cause contamination of the next product to be processed in the same equipment. Across different countries, there are specific regulatory bodies set to ensure the quality of the processes used to clean manufacturing equipment after processing of pharmaceutical products the US for example, the Food and Drug Administration is the body put in charge of over-sighting cleaning validation across different manufacturing and processing companies. The process of cleaning validation involves more than one step. A clear and predetermined methodology should be followed in respect done to the documentation done before the beginning of the whole process. This means that deep research should be done to determine the clinical aspects and evolution properties of all organisms found in the equipment. The microbial study is often done during the initial stages of the whole study to know what the residue inside the equipment being cleaned is made of. It is necessary when different types of products are manufactured back-to-back. 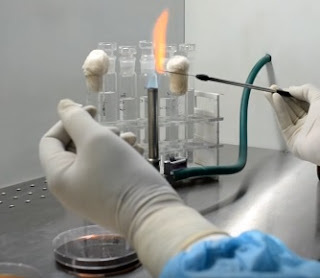 During the microbial study, the microbes collected from the equipment should be stored in pre-sterilized containers to avoid further contamination of the study specimen. A contaminated specimen may lead to biased results during the final study. Over the years different regulatory bodies have noticed the importance of microbiology in cleaning validation. A lot of emphases is done on thorough microbial studies and research before, during and after the cleaning process. The whole process of cleaning validation mainly involves the collection, storage, study and analysis of different specimens collected; on different parts of the machine being cleaned. The microbial contents of these specimens are studied and compared against each other. A contaminated sample will have a different microbial content value from an uncontaminated sample. The main steps taken when studying these specimens is microbiology and should be done by individuals with industrial expertise to ensure thorough research. Active residues contain elements that exhibit different microbial characteristics and clinical aspects. The detergents being used during the cleaning process should be studied through microbiology to establish the clinical value of their constituent ingredients. The microbiological process followed during the cleaning process should be clearly documented. This ensures smooth and swift checking by regulatory bodies and avoidance of confusion during the whole process. Microbiological study will remain one of the most important steps in cleaning validation because the results obtained will be used in many ways: determining the methodology to be used during the cleaning process, determine different elements like detergents to be used and to ensure the amount of cleaning done is of satisfactory levels before the next manufacturing is done. The microbial analysis is a very important process of cleaning validation and should be done by experts with relevant experience. In a rapidly growing economy, people tend to be quality-focused and cleaning validation is done on the manufacturing equipment always plays a major role in the final quality of the product.